End Point is a relatively new term. 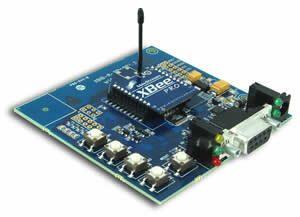 It has come to the fore to add a descriptor for Wireless based DAQ, Measurement and Control systems components. End Point is as it says - at the end of the transmission thread and is the interface to the real world system being monitored or controlled. These can be localised Serial or USB or even DSL Broadband, but are most commonly by Wireless Mesh, Wifi, Direct RF, 3G etc. One of the most common end point connection is with zigbee mesh, with hundreds of endpoints. A good example is a zigbee Mesh in a suburb reading electricity meters and controlling load. 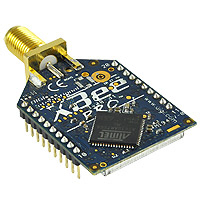 A system like this will have DAQ or Controller End Points feeding into Zigbee mesh, exiting via a 3G or WiFi Wireless Gateway, where all the data is concentrated and then sent via a router function to a corprorate server running an SQL database and from there to billing software and load centers etc. When the corporation wants to push control info out through the system into the Mesh and turn hotwater and air conditioners off or on, this is done by a Zigbee Mesh Switching End Point. End points can be single inputs or outputs. These types of End points are single function and hard wired and can't be adjusted, reprogrammed or reflashed remotely, they just get plugged in and do a simple task, say read a temperature, or close a switch, or read humidity or read a tank level. Other End Points, and this is a growing trend, are smart, programmable, remotely configurable, firmware flash upgrades remotely or over the air if it is radio. Powerful End points have all of this but also have the ability to be autonomous if the comms link is lost and these End Points will continue to do their job monitoring and log data until comms is recovered. The next progression for End Point development is a device that has all the previous features but adds the ability to monitor and control locally using a program installed. It will be autonomous or stand alone but can be adjustable remotely for new set points. The new Zigbee programmable Mesh IO units have this. The most sophisicated End Points are multitasking, multipersonailty end points that can do several jobs at the same time. This is just more software and larger micros, and are available. Data from End Points feed to a cloud based database with clients having access to this data. Alarms from the End Point can be managed by the Cloud Database System. Alarms will generate SMS or email response. Data can be sent by ftp needed. However for critical sites, sophisicated endpoints will generate SMS directly, by-passing the cloud, if the cloud is down. End Points differ from most devices strictly in their ability to do a job when plugged in, they have preset functionality or they can over the air or Broadband configured.